"Buck Sanders Hunts A Hat"
This fellow I know—Jake the Snake, we call him—runs a horse outfit up in Montana. He run a herd down into Nevada and on the way he lost his hat in a dust storm, dang thing sailed right down into a deep canyon up near Battle Mountain. Rough country. Anyways, he had a neckerchief around his head, like those Mex peckerwoods sometimes wear. I met him goin’ over to get a new hat in Bodine, which was a ninety mile ride and after he got himself a new hat he got on a good drunk and he laid in the middle of the street all afternoon and everybody in town had to walk around him. So, then he gets on the train and goes down to Reno where he proceeds to go on another bender and then he took another train to Stockton, California and he knew a gal down there who used to live in Nevada, so he went over and looked her up and asked her if she would like to get married and she said, ‘All right,’ and so he gives her a hundred dollars and told her to buy some duds and he’d go and shave and be right back so they could get hitched. Instead he went and bought another bottle of rattler juice and got on the train back to Reno, fooled around there some, then came back up to Montana where I saw him on the street and told him I admired his new hat, which was a Boss of The Plains type deal. Simple, but not too extravagant like some folks are fond of wearing (looks at Ojos). Anyway, I asked him what it cost him and he said, “Oh, 'bout $2,500 and change,” and when I told him that was plumb loco, he told me that wasn’t the half of it. Turns out the father of his intended bride came clear up to Montana to sue him for breach of promise. Cost him three horses and $150 in court costs. He told me he was wearing that damn hat 'til the day he died. And I damn sure believed him. 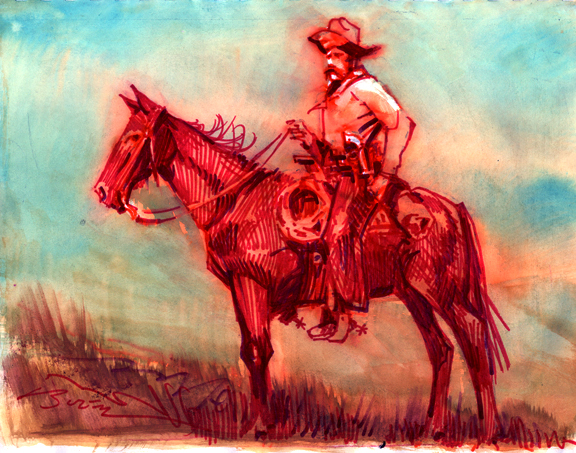 Full Disclosure: I poached this from a story Ed Borein told in a booklet, "Vaquero," I bought at the Santa Barbara Historical Museum last week. Frankly, it was a pretty bad story, but I was struck by the odd turns he took and strange specifics he added, and although I felt I had to improve on it with the ending and give it some sort of punchline, almost all the locations are intact from the original story. And, frankly, that's the part that's almost unbelievable (the cowboy went from Montana to Reno, Nevada to Stockton, California and back! ), and yet those old-time cowboys thought nothing about those kinds of distances and it was not uncommon for those old boys to stay drunk for days. "If you can't improve on a story you've got no business telling it in the first place."